– As they come back into view, they began to disappear again…or this is a controlled slow motion of the video tape of the first disappearance. – during this second disappearance sequence, they actually seem to come back into view and disappear two or three times. And during these reappearances, there seems to be more than the two original crafts…at least four and maybe five or or possibly six. They phase in and out as if there are more than the two crafts…even more than the possibly three crafts. – As the small crafts finally disappear over this period of a few seconds, the satellite also fades out of view, slightly back into view, then back out ( all simultaneously with the crafts), and you see nothing but what appears to be perfectly natural clouds where the satellite and crafts were located. It seems as if all actually disappeared into our so-called natural three dimensional atmosphere…or, unlikely, they simply and totally vanished from existence. This is very close to what the people with me and I saw many, many times…from the time I was two or three years old in 1939 or 1940 until I was age 48, during the summer of 1986…in August, at Maloney Lake just south of North Platte, Nebraska. However, most of the strange activity occurred on the ground and very close to the ground. At times, when we saw more than one craft of the same type, we thought we were seeing more than one craft. However, in the late 1980s, after analyzing my experiences when others and I previously rode in the craft, I recalled that the view of our surroundings seem to fade out at times, when we could see nothing but illuminated haze or fog. We couldn’t even see our hands in front of our faces. After these strange periods of illuminated blindness, we could see ourselves and the interior of the crafts again. After my late 1980s analysis, I came to the conclusion that when we stood on the ground, during all of those years and saw more than one craft near us, we were not seeing more than one craft but the same craft that seemed to be disappearing and reappearing at another location or at other locations ahead of its self, all at the same time……thereby defeating or warping our time/space continuum. At times we had seen as many as six crafts or six versions of the same craft, all at the same time. Those crafts and objects we saw during my encounters, when we thought we saw more than one craft, remained relatively stable. They moved a little, but somewhat stayed in the same locations for a minute to several minutes. A craft, most probably the last manifestation, would sometimes fly off away from us for several yards before it disappeared permanently. And at times we watch the final version of the craft fly off over the horizon, momentarily disappearing and reappearing ahead of itself. Yet, at times the crafts disappeared near us. It is obvious that the crafts and satellite in this video and the crafts we encountered during my experiences were from another dimension, possibly from another time/space dimension (continuum) that is similar to ours…and that “they” (whoever they are) can penetrate or overlap our time/space continuum. Of course it is possible that this video is an example of time travel. I believe it actually is possible that someone in the future is visiting us now….and that it is possible this someone might be us. The video also could be an elaborate production of holographic technology, which has been demonstrated by our research and also our entertainment sectors. Or of course it could be a doctored video completely, a false display, a display of fiction…but I doubt it because it so accurately demonstrates what we saw during actual UFO encounters over a period of 46+ years. It also is obvious to me that when we were riding in a craft, we were experiencing a sort of never-never land between dimensions…or between time/spaces in our world. To understand this more thoroughly, you should read the books I have authored…especially the book To Earth From Heaven. If this video is valid, it demonstrates many of the mysteries surrounding modern UFO sightings and close encounters, as well as many mysterious historical happenings that are related to the ancient gods. The video, if valid, additionally contributes truth to many descriptions written in The Bible where there are clouds involved. There are many more examples in my story that validate the fact that what you see in this video is most probably real. And one could say the opposite also is true: This video validates my recollections and others’ recollections of my (our) mysterious so-called UFO encounters. Before giving my talk to the 2001 International Congress Convention, I developed a simple real-time visual demonstration of the appearances and disappearances of “The Windowed Saucer” which others and I saw many, many times throughout the 46+ years. It is very similar to the disappearances and reappearances of the crafts shown in this video. My animated video was created in 1999 or the year 2000. If you are interested in seeing it, it is located about one third of the way through the video presentation of that talk to the 2001 International UFO Congress Convention which is offered here on the Home Page of this website. It is located at about “25:50” of the video timeline. As you can see, the video of the Black Knight and smaller crafts portrays what seems to be actual happenings in orbit above our Earth…the crafts eventually phasing in and out of view toward the end of the sequence. This is how other videos demonstrate the nearly unbelievable appearances, movement, disappearances and reappearances of allegedly other modern UFO craft. There are many videos online that demonstrate essentially the same thing, sometimes the craft appearing to be lights that blink in and out of view. And they most often are high above the earth. Some of the crafts captured on video seem to be a few to several hundred feet to a few thousand feet above the ground…i.e. some distance away from the observer. Yet during the encounters the other people with me and I experienced, and as described in reports of modern UFO encounters experienced by others, the craft comes into view and goes out of view sometimes up close and personal….just feet and yards away. The important thing to know here is that it appears to be the same phenomenon…except when the viewer is on the ground, as in my case, there are other entities involve, such as beings appearing to be human and some appearing similar to alligators or lizards, etc…beings who communicated directly with us. When I was a child, family friends took three photos of me on my bicycle with the discs with headlights manifesting in the background. The first photo was of the car, me, and the discs appearing to be very low hanging clouds in the background. The second photo was of the car, me, and the clouds appearing to be clouds but also like discs with voids where the lights would eventually appear. And the third photo was of the car, me, and the fully metallic discs with their headlights shining. For years, my parents kept these photos with their other family photos. Decades later, after my parents had died, a cousin visited us in our home and saw the manifestation photos. She said the discs looked like UFOs. She then stated that she wanted to take them to a friend, a UFO expert, to find out what they truly were. I gave the both the positives and negatives to her because I had no idea what they were and I had bad feelings about them. Later after she had died and when I tried to recover them, her family said her estranged husband had stolen and destroyed all of their family photos. When I was fifteen years old, I traveled with my aunt and uncle and their family on several trips. During this trip, we were in Santa Fe, New Mexico, in the street, at the northwest corner of the city square. The first photo was taken of the booth as it was manifesting. It looked like a cloud, but also like the booth with open door, open windows, and squared corners. After it had manifested, appearing to be something similar to solid white plastic, my aunt took the second photo. Then after my cousins and I sat on the benches inside, my aunt took the third photo. We children were all waving through the windows. Because it seemed so strange, she got frightened and told us to get out of the booth. She then tried to take another photo, but her camera malfunctioned. Other things frightened my relatives and we soon left the city square. When my aunt was old, she asked if I wanted the photos and negatives because she was going to go to a nursing home and she was going to thin out her family photos. She said if I didn’t want them she would throw them away. I had no UFO recollections at that time, but I look at them and immediately got extremely depress. I told her I didn’t know what the booth was and as far as I was concerned, she could throw the photos away. Sadly I was never able to retrieve either set of photos and I feel the mysterious intelligences had orchestrated my negative feelings, as well as the destruction of the photos. These photos are the only photos I recall that were taken of the crafts and objects we encountered. They would have been excellent evidence supporting the validity of my story. Yet, because of a wealth of other supporting evidence, including witnesses to parts of a few encounters, I can confidently state that the others with me and I saw the mysterious appearances, movement, disappearances, and reappearances, etc. of the crafts and objects many, many times over that period of 46+ years. 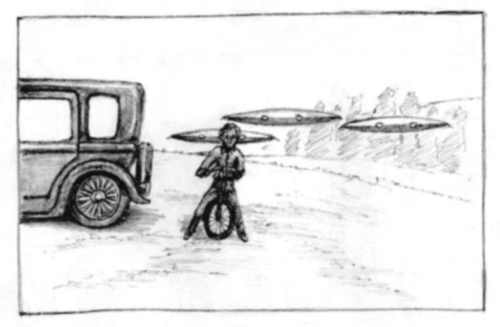 During one encounter when I was hunting pheasants with my father in south-central Nebraska…in the late 1950s or early 1960s…the mysterious intelligences told me that they manipulated the atomic and molecular structures of matter to make the strange crafts and objects appear, disappear, and change form. As the information was being explained, I saw a craft materialize from fog or a cloud, then change form, then disappear. A little later I was encouraged to cooperate more fully and commit myself to their plans, etc, etc. I assumed, as the manifestation was being demonstrated and explained, that the atoms and molecules of the fog or cloud were somehow being manipulated by the mysterious entity who was speaking to me. I also felt that he was being helped by other intelligences I couldn’t see. During other encounters when riding in a craft, I also was given other demonstrations concerning how the craft and those of us riding in the craft could manifest at another time and location. Those who were with me and I actually experienced the manifestation from inside the craft. See other articles here on http://www.johnfosterufos.com or read Chapter 12 of the book Eminent Discovery for additional information. Believe it or not, this is all true. I watched the whole video. Pretty compelling. Is there a way to know it’s not a fake? It was especially interesting the way they disappeared. The nature of the disappearances, movements, and appearances is very similar to what we witnessed during my (our) encounters. If you consider the fact that nearly no one wants to talk about the fact that they do indeed mysteriously appear and disappear, it indicates that this is something with which most people don’t want to deal. Besides this, critically analyzing the probability that someone could fake the video with the detailed characteristics shown, the details that I’ve listed, the same details that are similar to my encounters, and details that I haven’t advertised widely, is so high it seems impossible.